Volunteers are needed for the Franklin Downtown Partnership and Franklin Garden Club's annual Beautification Day in downtown Franklin and the Town Common on Saturday, May 18. Community service hours are available to high school sports teams, scout groups and students needing volunteer opportunities. Dozens of volunteers are needed to help plant flowers and greenery on the downtown bridge and in barrels in front of businesses. Volunteers with trucks are also needed to help pick up a few trays of flowers at 7 a.m. at Fairmount Fruit Farm, 887 Lincoln St., Franklin. Anyone who would like to lend a hand can grab their garden gloves and meet at 8 a.m. in the small commuter parking lot on West Central Street near Central Pizza and Hair Mania. Work is expected to wrap up by 11 a.m., or earlier if there are more volunteers. The event will go on rain or shine. If you can volunteer, please notify us by email. Sponsors are still needed for Beautification Day. 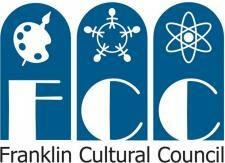 Please email downtown.franklin@yahoo.com to be listed as a sponsor on signs. The Franklin Downtown Partnership is organizing the 17th annual Strawberry Stroll, set for Friday, June 14, from 4 p.m. to 8 p.m. in downtown Franklin with a rain date of Saturday, June 15. The Strawberry Stroll is the largest event of the season with more than 100 vendors, food booths, entertainment and activities. The Partnership is excited to announce that Dean Bank is the Platinum Sponsor of the Strawberry Stroll and will once again host Dancing on Dean, featuring two local bands at the corner of Dean Avenue and Main Street. Businesses, crafters and community groups are all welcome to participate. Booth spaces are free to Partnership members; fees start at $75 for non-members. The deadline to participate in the event without a $25 late fee is May 24. No registrations will be accepted after May 30. To register for a booth space, go to http://bit.ly/strawberrystroll. For questions, please email Strawberry Stroll Chair Scott Martin. 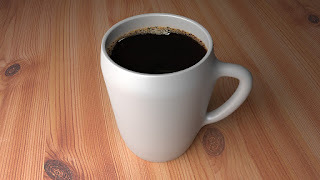 Enjoy a hot cup of coffee or a tasty breakfast with other Franklin Downtown Partnership members at our next Networking Breakfast on Friday, April 12 at 8 a.m. We'll meet at the Dean College Dining Center on the first floor of the Campus Center. 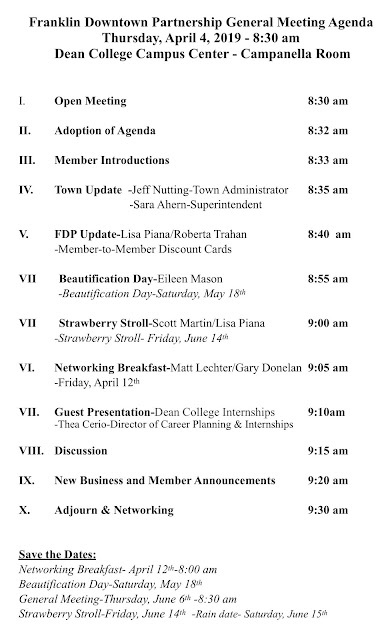 Please join us for the next general meeting of the Franklin Downtown Partnership on Thursday, April 4 at 8:30 a.m. We'll meet in the Campanella Board Room of the Dean College Campus Center. Dean College Director of Career Planning and Internships Thea Cerio will give a brief presentation on the internship program at Dean College.